Do you sometimes find yourself a bit short on time and on CHEST DAY of all days? No worries, I’ve got a 15-minute workout for every body part, and this one is for chest. The first two exercises and the last two are super sets, which are two exercises for the same body part done back to back with no rest in between. For instance, on your first set you might do the smith machine flat bench press for 12 reps, then immediately pick up two dumbbells for 8 reps of the neutral grip flat bench press. Rest 60-90 seconds between compound sets (by the way, this general guideline applies to most compound sets). Start: Take two dumbbells, lie on a flat bench and turn your wrists so they face each other, hands at each side of your torso. Move: Press the dumbbells upward, allowing them to naturally move toward each other at the top (without touching or under control at the very least). Then reverse the move back to the start, getting a good pectoral stretch at the bottom. 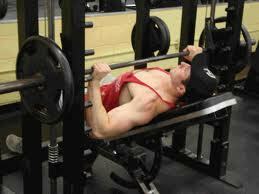 Start: Position yourself on a bench so the bar lines up with the middle of your chest. Now get up and load some plates on, lie back on the bench and grasp the bar with a slightly wider than shoulder-width grip. Move: Keep your elbows pointing outward as you press the bar straight up. Pause at the top, then lower the bar until it’s slightly above your chest. If you reach failure without a spotter, simply rack the bar on the nearest hook rest. Start: Position the handles of the machine so they line up with your mid to upper chest, sit back in the seat and grasp the handles with an overhand grip. Move: Press the handles straight out in front of you until your arms are fully extended but not locked, then slowly bring your hands back toward your chest without letting the weights touch the stack. Start: This exercise is similar in execution to the flat bench flye, except that here your body works harder to keep you stabilised (personal note here; destabilising you’re core is only effective if you can still handle weight that takes your muscles to failure safely. 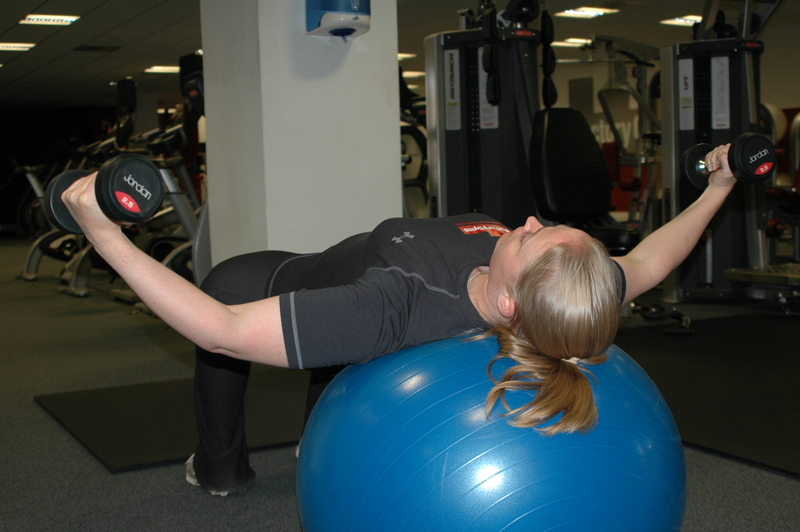 Grab two dumbbells and lie back on a ball so that you face the ceiling with the ball supporting your chest girdle. 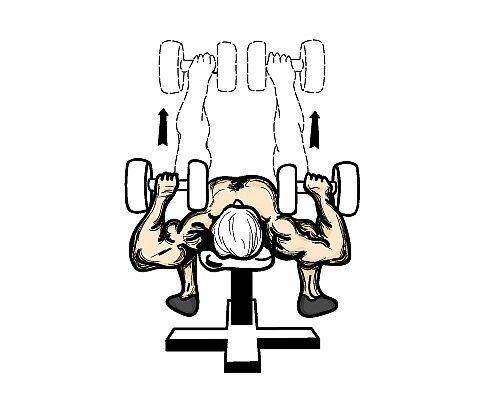 Extend the dumbbells out above your body, maintaining a slight bend in your elbows throughout to protect them from hyperextension and to keep the tension on the pecs. Move: Without altering the angle in your elbows, bring the dumbbells up in an arc toward each other, stopping just short of touching over your chest. Lower them back along the same path to the start. To get more upper-chest emphasis, lower your hips toward the floor and perform in the same manner. Start: This one will really work your shoulder stabilisers and improve your strength, balance and muscular coordination. Make sure the ball is fairly secure (place it in a ring rest if you can find one), and with your hands on the ball and feet on the ground, get into push-up position. Move: Keeping your body straight as a plank, lower your chest to the ball by bending your elbows (let them point outward as you descend). Once you reach the bottom, press yourself back up to the start, don’t play bouncy bouncy it’s not big and it’s not clever. For most guys, ‘chest day’ is the best day of the week, well as far as training goes. Here I’ll set you on the right path in your chest quest with a machine heavy routine that primes your pectorals for more specialised training down the road. To begin with, err on the light side when choosing a weight, if you can’t finish the set with good form it’s too heavy. Where you see a decreasing rep scheme, pyramid up the weight each set; if the reps are the same set to set, choose one challenging weight and use it for all the listed sets of that exercise. 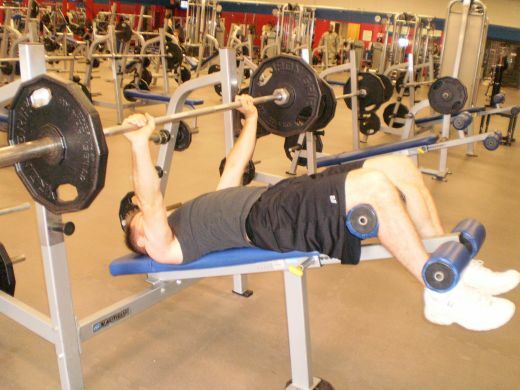 Start: Lie back on a bench set to about a 30–40 degree decline. Grasp the barbell with an overhand, slightly wider than shoulder-width grip. Lift the bar from the supports and hold it over your lower chest, arms extended. Move: Lower the barbell to your chest, touching down to your lower pecs lightly before pushing the bar back up to full extension. Start: Position yourself on an incline bench (about 45 degrees) so that the bar touches the top of your chest just below your collarbone. Once your position is set, get up and load the bar, then lie back onto the bench and grasp the bar with a slightly wider than shoulder-width grip. Move: Press the bar straight up, stopping just short of elbow lockout. (Feel your pecs contract to bring your arms up above your torso.) 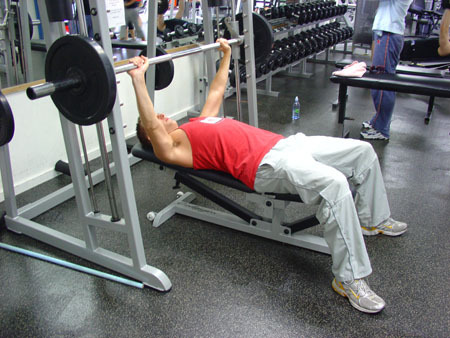 Pause at the top and lower the bar under control to your upper chest. 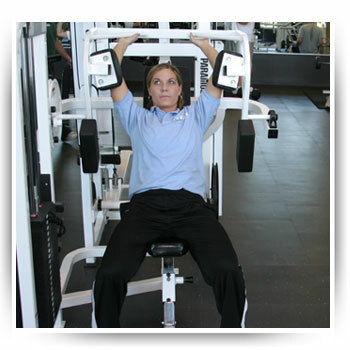 Start: Sit in a pullover machine, grasping the handles with both hands while placing your elbows against the elbow pads. Move: Bring the handles down in front of your torso, pause for a moment, then return back to the start under full control. To keep your pecs active, put more emphasis on pushing the bar down with your hands, rather than leading with your elbows pressing against the pads. In addition, actively flex your entire chest as you pull the bar down; using this “flexing” technique on all your chest exercises will help you develop the mind/muscle link that in time gives you pinpoint control over your muscles and their actions. Start: Sit in a pec-deck station, placing your elbows and forearms on the pads. For best results, position your arms so that your elbows fall just below your shoulders, and limit the stretch to just behind your chest. Move: Squeeze your pecs to bring the pads together in front of your chest. Flex your chest hard at the moment in the exercise when your elbows are together and always lower the weight under strict control. Don’t bounce. Start: The traditional “drop-and-give-me-50” push-up is done with a flat back and hands just outside your shoulders (on steps or the floor). Move: Press to full extension, keeping your elbows pointing out, and lower under control. Don’t sag in the middle. 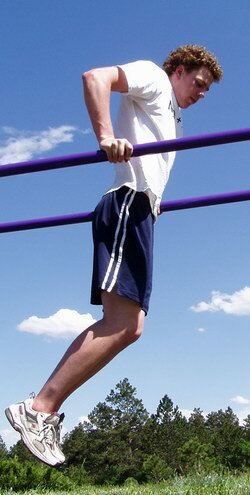 Start: Grasp the bars with your arms extended and locked. 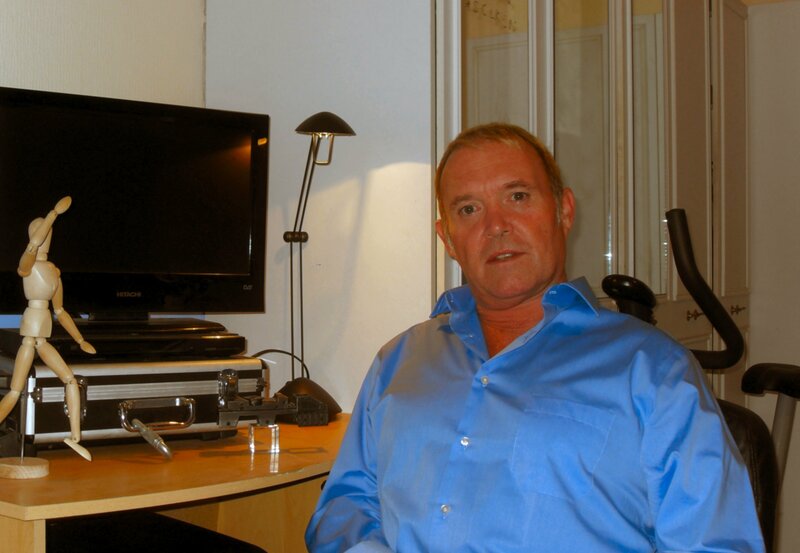 Lean forward, bend your knees and cross your legs. Move: Keep your elbows out to your sides as you lower yourself down, dropping until your upper arms are about parallel to the floor. Squeezing your palms toward each other in an isometric fashion, begin pressing back up until your arms are again fully extended. Be sure to keep leaning forward or the exercise focus will shift more to your triceps. BODYBUILDING SECRETS REVEALED SECRET #4 Hydration cont. When your goal is to build bigger pecs as soon as possible, getting creative with exercise selection is not only unnecessary, but in most cases counterproductive. Machines certainly have their place in a hypertrophy routine, but anyone who tells you he got a big chest by doing only the pec deck is either lying or selling a pec deck. Adding size requires focusing on the most basic lifting equipment in the gym: barbells, dumbbells and benches. The following six-week chest-building routine has you training the pecs twice a week and hitting the muscles from top to bottom with incline, flat-bench and decline exercises – four of them free weight pressing moves and one cable flye thrown in as a burnout finisher. The reps top out at 10 to encourage heavier weights and promote hypertrophy, and volume bumps up to 16 sets per workout in weeks 4-6 to maximize mass. Nothing fancy, nothing cute. Just simple and effective. Perform twice a week with 2-3 days between chest workouts. Bench Press; 3 sets, 10, 8, 6 reps.
Incline Barbell Press; 3 sets, 10, 8, 6 reps.
Dumbbell Decline Press; 3 sets, 10, 8, 6 reps.
Decline Barbell Press; 3 sets, 10, 8, 6 reps. Bench Press; 4 sets, 10, 8, 6, 6 reps.
Incline Cable Flye; 3 sets, 10, 10, 10 reps. Perform all pressing exercises with a pyramiding rep scheme. On your first working set, choose a weight that allows you to reach 10 reps, then increase weight on each successive set so that you can only do eight reps on your second set and six reps on your third (and fourth, where applicable).